PRACH Message Structure and Access Timeslot Structure data and control bits of the message part are processed in parallel. 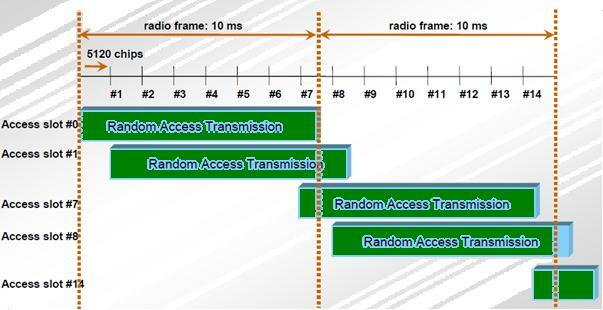 Here I write about PRACH Message Structure and PRACH Access Timeslot Structure for WCDMA 3G with its Flow in Image. 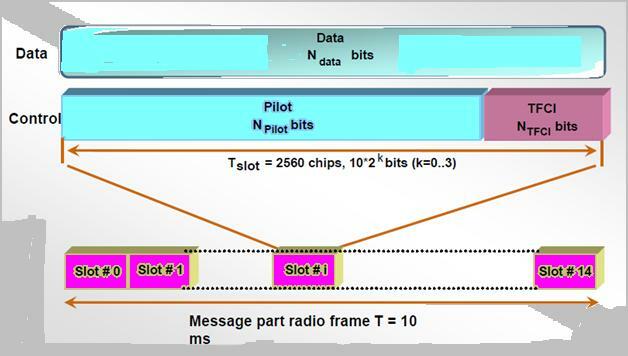 The data and control bits of the message part are processed in parallel. The SF of the data part can be 32, 64, 128 or 256 while the SF of the control part is always 256. The control part consists of 8 pilot bits for channel estimation and 2 TFCI bits to indicate the transport format of the RACH (transport channel), for a total of 10 bits per slot. The OVSF codes to use (one for RACH data and one for control) depend on the signature that was used for the preamble (for signatures s=0 to s=15: OVSF control= Cch,256,m, where m=16s + 15, OVSF data= Cch, SF, m, where m=SF*s/16. The PRACH transmission is based on the access frame structure. The access frame is access of 15 access slots and lasts 20 ms (2 radio frames). To avoid too many collisions and to limit interference, a UE must wait at least 3 or 4 access slots between two consecutive preambles. The PRACH resources (access slots and preamble signatures) can be divided between different Access Service Classes (ASC) in order to provide different priorities of RACH usage. The ASC number ranges from 0 (highest priority) to 7 (lowest priority). 26 queries in 0.382 seconds.